That’s right, my guest Will Hamilton is a professional college tennis player, who leveraged his knowledge and skill with the game to create a six-figures a year information publishing business, based around a model that uses a blog, videos and a premium membership site area (that model should sound familiar to you). You can check out his site at FuzzyYellowBalls.com – that’s a tennis ball reference in case you couldn’t guess. Will started by creating instructional videos on how to play tennis, which he circulated via YouTube (his channel is YouTube.com/fuzzyyellowballs). His angle was to create videos of a better standard than anyone else out there and capitalize on the YouTube traffic, bring those readers back to his website and then get them on to his email list. A few short years later and it’s worked really well. 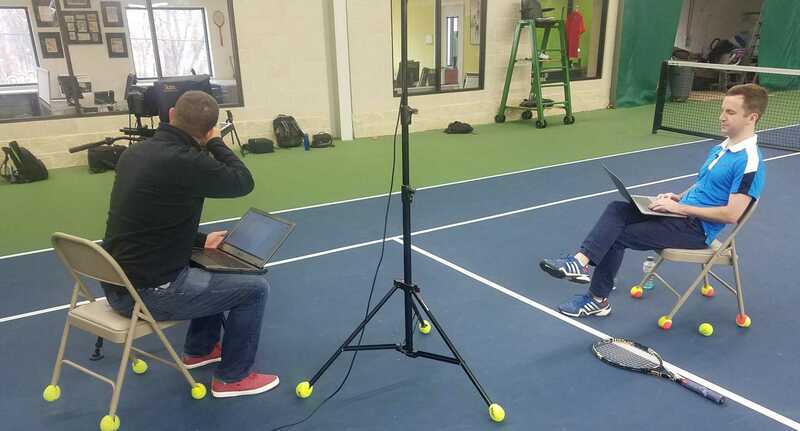 He has several hundred videos, resulting in a million video views a month and an email list of 60,000 subscribers – one of the largest email lists in the tennis industry, and it all started as a simple two-man operation (Will and his tech partner Adam). Once Will established traffic, he realized that his original plan of monetization via advertising wasn’t cutting the mustard, so he decided to follow the premium membership strategy, launching a $25/month a membership site, which currently boasts over 600 paying members. Do the math and that’s over $15,000 a month). Will’s story is definitely worth a listen because it’s yet another great example of someone starting with a skill, and through consistent work, launches an online business that results in getting paid really well to talk about something you love. It’s also a great example of the little guy rising up to challenge the large media companies. Will receives press status just like mainstream media journalists when he attends tennis events. It’s quite impressive how far a blog can take you (and yes I’m a little jealous – I’d like to hang with tennis pros too). Really your video is most informative. It shows very clearly each and every single step. Thanks for your information. I do have an issue with this post. This guy had a email subscriber list if 60,000 people before he launched a membership site. Is there a way of being successful with a membership site without such a large subscriber list? Very good video, shame about the latency/lag parts! It just goes to show where perserverence can get you, that and playing to your distractions! Great video… I can easily second the “video to success” aspect of an online business… it counts as a large portion of our traffic and saves my company lots of time that would have been spent doing technical support! What an effing great find! And a fascinating interview. The time is obviously right to do this sort of business, a few years ago I tried to enter this market (or create it, more like it) but the video stuff just wasn’t ready yet. Knowledge is Power! The great thing about this information is that it can be applied to any service or product. Just today, I read on another blog that most people will not pay for a membership site because there is so much free content out there. Why buy the cow if you can get the milk for free? It is critically important that the marketer is clear how he will make a distinction between free and premium content. This is critically important to making a membership site viable and successful. You did a wonderful job in clarifying how a marketer can do that! Yes a great and encouraging video. And I do hope that teaching sells in the long run. Those kinds of interviews help. My thanks to Will and Yaro. Great Post. Makes me wonder if it would be possible to do the same in other sports. Particularly Basketball and Baseball. Thanks for the great Video. Wow that is really great that he can do the thing he loves and still make money online, thats a great combination. This video was very informative, thanks for sharing it. Hey Yaro, don’t be jealous of Will, just hit him up for free tickets at his next tennis tournament. Seriously though, it is good to see a membership site blog (NOT about blogging) that is doing well. It is good to have a look at his site to see Will’s business model in operation. Yellow Fuzzy Balls! What a name, and what a great marketing story! It just goes to show that putting in the effort to be the best will most certainly always pay off. thanks guys, GREAT IV, its such a help to see the big picture and see inside the REAL workings of a big and successful gig like FYB….i’m ow even more inspired & motivated ….so again thanks…. you rock!! The greatest success stories of entrepreneurship inevitably depend on the entrepreneur turning what he is passionate about into a workable business model. Here is another one that needs to become a classic for students of business and entrepreneurship. Thanks to both you and Will for the very informative interview. The niche, although one of your pets, is different and not part of the usual ones on how to make money online. It gives a fresh angle and we get to see that anyone in any niche can succeed as long as they’re passionate about what they do and are willing to learn and work hard towards that goal. You interview are awesome and we become more confidence about our work. I disagree, I liked your long hair. But that’s probably because I’m in the music biz. Anyway, great video. I think hubby and I may have jumped the gun with our site, but we’re working at it and should be successful. I wish I’d found Yaro six months ago! I remember wondering, when he started his membership site, if he was one of your prodigies, Yaro. Nice to hear your story here, Will! Great video! Premium information vs. what is available for free is vital when it comes to making money with a teaching site. Your visitors seek specifics, not the “same-old-same-old”. Great story. And here is another example years of work and persistance is very important for success. What an awesome interview. It really makes me reconsider all of my IM and how I want to start something similar because I do know a few people who are quite high up in the ranks in a few sports and I really should get something going with them. Great interview! I’ve been playing tennis since I was 7 years old and came across the FYB site several months ago while researching membership sites. Tennis was one of the niches on my short list since I have connections with many teaching pros and some players on the tour. However, after coming across FYB I pretty much scrapped the idea. I have a few questions for Will if he’s reading the comments: How much traffic were you getting to your website when you launched your membership site? 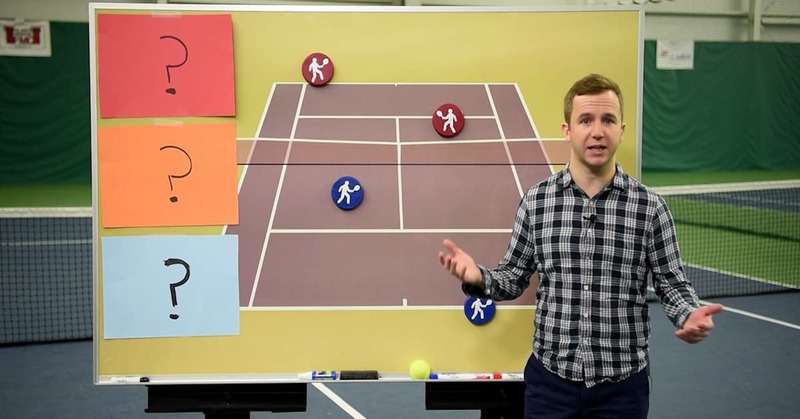 Do you still teach tennis regularly offline? How many of your paid members come from your offline connections? Thanks Yaro for inspiring us with another awesome video interview. Hey everyone — Thanks for the kind words! Colby — We were getting over a million video plays per month when we launched FYB Premium. So we had a lot of traffic when we launched. I don’t teach tennis lessons “offline” anymore — not on a regular basis, at least. I’ll occasionally give someone a lesson where we film the whole thing and put it online but that’s obviously different from traditional tennis lessons. None of our paid members come from offline connections as far as I know. If you have any more questions don’t hesitate to shoot me an email. Thanks again for the interview Yaro! I really enjoyed it. Thanks Will for responding to my questions. Best of luck with the website! Will’s story is extremely inspirational… It’s just another person who was able to think outside the box and managed to use that to his advantage! He took his skill set to the next level and that’s a great talent to be able to follow-through with your plans. vidio very informative and interesting to be listened to. Wicked video, thanks. Very interesting and I’ll watch it again me’s thinking. Yaro, great video and a great example of offline biz going successful in online world. You asked some great questions – makes the information shared so much more powerful. Thanks. Pretty interesting how he uses the internet and tennis to make money. Actually brilliant. Very cool interview and thanks for sharing. I am impressed that Will was able to take such an inherently offline activity like teaching tennis and turn it into an online business at all, not to mention a successful one. Thanks for sharing your great success story. Not many people would be willing to share the way you have. I know many of us appreciate it! Is is really great to see that there are others having success in an unusual niche. It is very reassuring! Great info, again Yaro and thank you, Will for sharing. I’m starting to add more video to my sites and I loved the idea of the green screen material. I did a quick Google search and found a few sources – does anyone have any recommendations? Also, I just want to change up the background for variety. Does anyone have any suggestions on where to get images to drop into the video? Hello Will. Can you discuss some of the software you are using to edit video and software you use to compress the videos? We use Adobe Premiere Pro CS4 to edit video and Adobe Media Encoder CS4 to compress / render our videos. To be honest, Premiere Pro is a little buggy and doesn’t handle certain video formats very well. If I had a do-over I’d strongly consider Final Cut Pro (never used the program but my brother has worked in Hollywood and is a big fan of it — much more stable, among other things). This is another great example of how someone can build a nice income in some of the places noone would think of. I just seen a clip today of a lady who started showing people how to appy makeup on youtube and now makes a ton of money. But she started by doing something she was passionate about, and it payed off. Hi Yaro, thanks for a good conversation (I listened to the audio due to download restrictions on my internet account). The only thing I would have liked to hear more about was why/how he chose the membership site as the way to go to make money. longer and layered than the way you had it. You’re adorable anyway, however. Thank you so much Will, for sharing. And Yaro for getting this information put together and published. I’m learning about the power of YouTube as well. In the gaming niche, I’ve built a membership of 781 people in 3 months – and your story is very encouraging to me. Worth watching every minute till that very last tip! Thanks again! but the strategy’s you talk about work. I know 1st hand . You give the best interviews out of anybody I´ve ever heard giving interviews about how to make money online…if not about anything! Every time I have a question pop into my head, there you are asking it. Thanks for getting these great interviewees and case studies, and for being so thorough and detailed with your questions. Really appreciate it! This is so inspiring! It also shows there is no such thing as overnight success. It took a lot of passion, perseverance, trial & error until Will Hamilton got to generate revenue. Really enjoyed the video. Thanks for finding and sharing. BTW, looks like you are still in your PJs. Did you just roll out of bed? Thanks Yaro and Will. Very good information. I particularly appreciated how, after each part of the discussion, Yaro summed up the steps to Will’s success in simple steps. Made it easy to understand the process. Thanks again. A question for Will – that “white board” on which you do your markings/instruction… can you tell me more about that and how it links into the video? 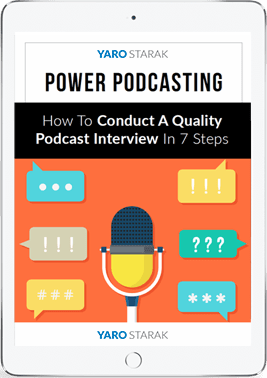 I love the podcast case studies – thanks! This came at just the right time – I’m announcing my first membership site tomorrow, after 4 months of work, and launching it February 1. I’m trying to keep expectations in check, but the whole idea was inspired by reading your ebook last Fall about the value you can create with a membership site. Great interview, Yaro, and very informative. I launched my own membership teaching site at the beginning of December, 2009. It’s been six weeks: my email list numbers 4,800, and the site has 400+ members now. You and Will are absolutely correct: video is critical to a site’s success. My site is very visual and video plays a central role in attracting and retaining members. I just opened a YouTube channel and posted a series of videos last week. I expect it will drive more traffic to the site, as it did for Will. Keep up the good work, Yaro. You’re a Guru! from what I’ve been able to see on the video this is a great interview. I am really interested in starting a membership site down the track and would find the advice in this podcast very useful. I’d like to be able to download the audio for future study and have tried to download it a few times but because I am on dial-up, it imes out all the time so I can’t download it. Any chance of breaking the audio up into 3 lots of 20MBs so those on dial up can download it? I’m sure all those on dial up would appreciate it. A great wakeup call, Yaro. Time I went back to polishing my very basic video skills, and checking out YouTube again. Awesome video, good information on creating a teaching/membership site. I loved the information on YouTube. Really enjoyed that video. Lots of great information, getting me to think about how to get some friends together and have fun making videos for YouTube! We are so used to seeing you with your old, scraggly hairdo. What a pleasant change for you! It’s nice to see your smiling face. I was wondering about the premium videos. Are they hosted on YouTube or are they hosted elsewhere? It’s just that I didn’t think YouTube allowed you to on-sell their content behind a membership site. I can’t speak for Will, but mine are hosted on Amazon’s S3 service. I have taken many of your ideas and applied them to my youtube channel “wavesdvdcom” with real content much like your fuzzyyellowball tennis pro. I have, however, found my own ‘secrets’ that have exploded my youtube views and my Relaxation Nature Video business on ebay, amazon, and my own website. I have gone from from 200 views a day at 5/10/09 to 6500 views a day in 1/29/10 and over 4000 views a day on itunes with my podcasts. Please email me directly, I would like to share some ideas with you and maybe we could do some business. I’m sure your readers would love to see a new youtuber grow his business now that youtube is so much more competitive than when Will started. Thanks for the information, Yaro. I want to get into videos, but really am clueless as to where to start. It would be awesome if you put together a post or a series of posts on getting started with video. Amazon S3 services is great to use for hosting videos. Great Service and free. Can’t ask for more than that. It’s great,I am always wiating for the case studies deliver by you. in the field of blogging. Really you are helping me with each and every mail !! Brilliant! Thanks very much for sharing. Very interesting interview!! This is exactly what I’m going to do for Snowboarding. This video has inspired me no end. Just need to get it off the ground now. It takes a lot of work and this is a fine example of some hard work that has paid off. Hello, Thanks for the video, I can see how much video marketing is so effective. I think it is time for me to create videos for my business entities. I really enjoyed this video! Will has great experience and he leverages the internet into his favor with the use of youtube. I love the example he makes when he was talking about having the technical difficulties with the videos on the site, and discovered that he got about 200 new sign-ups to his emailing list. Sometimes the best techniques are discovered through trial and error. Great interview, Yaro. Thanks for sharing!! As Paul never ceases to emphasize, the “days out there in the wilderness” are inevitable. You start making something you think people need, or something you are passionate about, or both, but may end up doing something entirely different. The only way to figure out what people are prepared to pay for, is getting your stuff out. Contrary to what Will says, it is probably pointless figuring out upfront how you’re going to make money. He may think with retrospect he could have avoided the waste of time doing stuff that did not pay off, but I think it was just a necessary evil. Wow!That shows how one can use your own skills for benefit.Smart of him on choosing sports,thats where all the money is if you are in business like me.I have surely learnt something.Thanks.Best of luck! Many thanks for sharing this video ! Love it, watched it twice, bookmarked it, and plan to watch it again. Thanks for the great interview. I shared this with my husband as he LOVES tennis. Very inspiring and shows that you can do what you love to do and make a great income as well. interesting article. his youtube page shows 24mil video views which is great but there are plenty of comedians/artists with 100mil views and they dont make anything near 15K a month… the smart thing to do is to start selling something useful under a reasonable price. Curious if anyone’s been on the site. My computer is blocking it because it has a red warning. Great interview! I love the real life-ness of Will and his business approach! Doesn’t seam over-salesy or too pushy. Regarding content, Will mentioned blocks or modules for learning. When setting something like this up on your own membership site, do you make “FAKE BLOCKS” for content you havent even created yet? That way you can drip feed the content a few times a month to new members, but they also get a preview of whats coming (even though it’s not created!)? Thanks, looking forward to your comments and GREAT POST! That’s not a bad strategy Jason, if your membership site software can do it and you are sure of what modules are coming up next. Yaro, Links for your Membership Site Mastermind coaching are all pointing to your Blog Mastermind program. FYI. That’s because MSM is now closed Howard. What I’m *fuzzy* about (Pun intended:) is how a membership site that covers A to Z in 6 months can really, really grab someone and get them to subscribe when maybe they just want to learn K to Z. Do these people ever say, “Well, I’ll just pay for the first three months even though I don’t really want that material.” ?? Great video Yaro. Very inspiring. I hope to take some of the information for my own opportunities here in Canberra at our local basketball club. I am one of these guys that utlize Will Hamilton’s site :Fuzzy Yellow Balls to supplement my own professional tennis teaching in my home town in Downingtown PA. I will launch my own website this 2013 Spring more to attract players for on court instruction. However tennis is only won of three professions I have. Primary money earner is in Industrial Chemical sales with FMC Corporation as an Account Manager earning six figures and then 10-15% of that from tennis instruction. The third job is as unsuccessful so far entrepreneur based on an invention in the orthopedic area. I invented a knee rehabilitation device to help patients recover quicker from knee replacement surgery. I used this on myself to recover and my prototype will be ready from China this Jan 2013. Want to know how I can attract investors / buyers without having to go through a whole bunch of lawyers and patenting processes. My partner is my orthopedic surgeon. I like the video, however, its a little misleading. He really doesn’t get as many views as he claims he does, basically, he puts up videos of professional tennis players who are searched a lot, so of course people will watch them. That is much different than having millions of views on his instructional videos. If you look at his teaching videos, they get much less play. I am not saying there is anything wrong with this, however, he isn’t telling the entire story.